This is the title of Robert Locke’s latest book. He will present it and comment it at a Business Breakfast with the Boostzone Institute on November 8th in Paris. Meet Robert in Paris on November 8th! 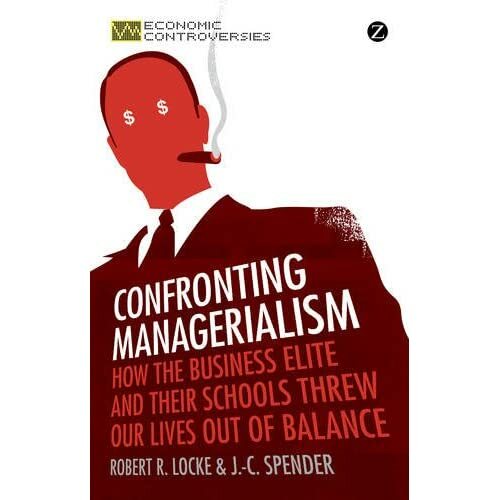 Robert Locke is a provocative writer with a serious academic background, as an historian, and a serious will to challenge the establishment of business schools, as they exist today. By challenging business schools he challenges actually much more: our obsession with shareholder value as a society and our ability to manage any type of organization within the current economic, social and political context. We have just been wrongly trained. Locke’s approach considers that the American model of MBAs might have been adequate for the post war period and even the “glorious 30s” period but is totally inadequate for today’s world. The implications are numerous, namely for how students in management are trained and how corporations build internal university programs. There is a need to completely revisit our approaches. But Locke goes further; he considers that managers have created cliques around them, considering themselves as a distinct professional caste. This, what he calls “managerialism”, is really what harms us. Thanks to other examples like the German one or the Japanese one Locke shows that other models of management, without the clique, are possible. One of his prominent examples is to show how the Japanese model of management “by means” gave the supremacy to the Japanese auto industry over the US one, based on a management “by results”. By believing, wrongly, that management is a science, the management clique lost the moral compass argues Locke; as one of the results the social performance of our society is extremely poor and unfairness, inequalities, frustrations are plaguing our times. Robert Locke is not the only academic to challenge the very way management is taught. The late Sumantra Ghoshal, although himself a member of the clique, criticized it very strongly in a seminal paper “Bad Management Theories Are Destroying Good Management Practices” . This debate on November 8th promises to be a heated one. It is not limited to a presentation of his work; Robert will be with us for a full discussion on the past and future of management education. If you want to register to this event (number of seats is very limited) send an email to Maryline.Gerlach@boostzone.fr (registration fee: 90 €; free for Boostzone Institute members). The book is included in the registration fee.